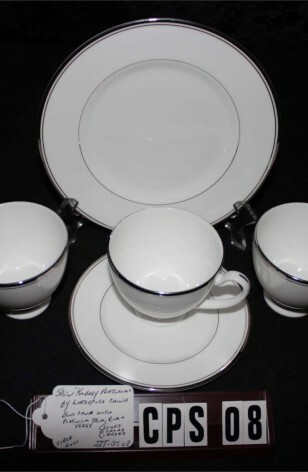 Waterford Fine Bone China, 5- Pieces of the Platinum "Kilbarry" Pat. #WFCKIP, Circa 2001. Five (5) Pieces of the Beautiful Waterford China in the "Kilbarry" Pattern #WFCKIP. Pieces consist of 3-Cups, 1-Bread & Butter Plate, and 1-Dinner Plate. This is a lovely White Bone China, with Platinum Verge ring on the Edge and Rim. A very Sophisticated Set. Great for Fill in to your set. Dinner Plate could easily be used for a Cookie Plate for a Tea Setting. Great Condition. Waterford Fine Bone China, 5-Pieces of the Platinum "Kilbarry" Pat. #WFCKIP, Circa 2001. Five (5) Pieces of the Beautiful Waterford China in the "Kilbarry" Pattern #WFCKIP. Pieces consist of 3-Cups, 1-Bread & Butter Plate, and 1-Dinner Plate. This is a lovely White Bone China, with Platinum Verge ring on the Edge and Rim. A very Sophisticated Set. Great for Fill in to your set. Dinner Plate could easily be used for a Cookie Plate for a Tea Setting. Very Good Resale Condition unless noted below or in pictures.